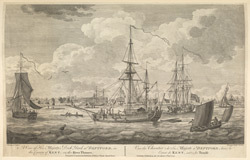 Deptford became an important suburb of London in the 16th century, when it was one of England's main shipbuilding sites. The Royal Dockyard and The East India Company's yard were established here during the reign of Henry VIII. Despite the town's reputation as a major industrial centre in the 18th and 19th centuries, the large majority of its resident families were poor. Most of the men were unskilled labourers doing seasonal work at the dockyards. Many unsavoury "fragrances" lurked in the air, as the locality was home to glue works, gasworks, tar distilleries, breweries and manufacturers of artificial manure!